“Taste the rainbow” is a quote that I hear almost every day on television. But I have never experienced the saying come to life like I have with Cup & Cake. Cup & Cake is a colorful brunch chain located all over Barcelona. I love brunch, so finding this place was a real treasure. With the rising and persisting popularity of Instagram and Foodstagrams, aesthetic picture taking that attracts foodies like me, is a marketing and advertising strategy that Cup & Cake can benefit from. The presentation of the food is bright. Cup & Cake serves up purple hummus, magenta eggs, and rainbow coconut shreds many people come to not only enjoy the food but to take a picture of it. Also, Cup & Cake doesn’t use refined sugars but uses fruit and vegetable sugar to sweeten their treats. All of their eggs are free–range eggs. This is a place you can feel good about eating sweets at, despite the natural sugar sweeteners. The environment is light and airy, with bare white walls, light wood furniture, and big windows to let all of the natural light in. 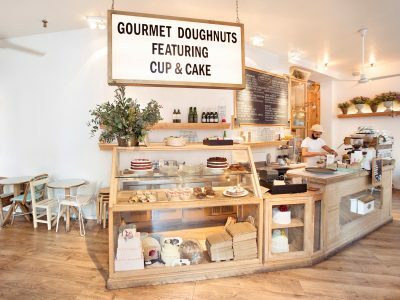 I can enjoy a nice sweet treat, relax, and eat gourmet donuts. You step into C & C and it feels as though your problems slip away as you indulge in ultimate delicious.